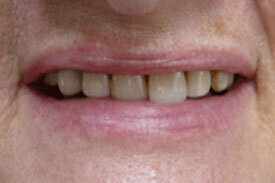 Stained and misaligned front teeth meant this patient wanted to improve the appearance of her smile. 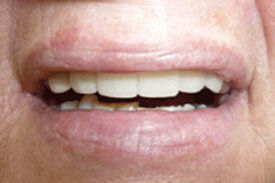 Five porcelain veneers were placed to restore her smile. 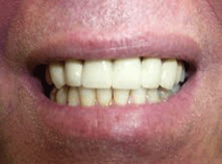 This patient wanted to improve the appearance of her smile before her wedding. She had small gaps between her teeth. She was given the option of composite fillings which would have a life span of 5-10 years or porcelain veneers which are able to last well beyond the composite option. 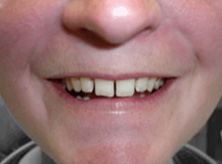 This patient wanted to improve the appearance of her smile due to the gap on the right. A single composite filling was placed on the small tooth to make a big difference. This patient was unable to look after his teeth for years. After several months of treatment, he is pleased with his new crowns and can smile with confidence again. 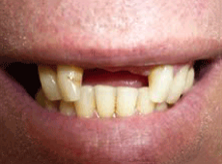 This patient was wanted a permanent solution to his missing teeth. A permanent bridge gave him restored function and a vast improvement in his appearance. 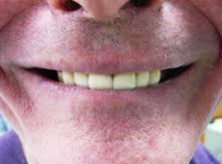 Although this patient wanted a permanent solution to his missing teeth, a denture was the option he chose to replace his failing upper teeth. The lowers were restored with crowns and a removable cast metal partial. This patient was a consultant and always felt like his customers shied away while he was talking, due to his very poor dental health. As nearly all of his teeth had to be extracted, he chose to have a fixed permanent bridge on six implants on both his upper and lower jaws. He has since learned how to properly maintain his oral health. 11 years on and his implants are stable and have changed his life exponentially. Call us today to get started on creating the smile of your dreams.